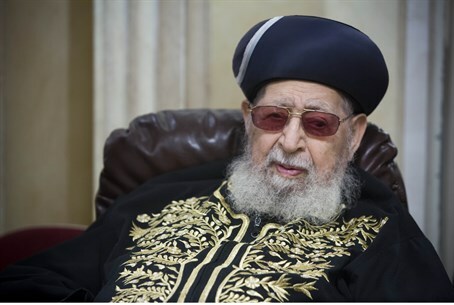 An explosive recording has been released showing former Shas spiritual leader Rabbi Ovadia Yosef slamming current party chairman Aryeh Deri for corruption, as tensions continue to escalate between Deri and is arch-rival Eli Yishai. Aired on Channel Two, the never-before-seen recordings are from a meeting held in 2008 between Rabbi Yosef and several members of his inner circle, including his top aide Tzvi Hakak. In it, Rabbi Yosef refers to the possibility floated by some Shas members of Deri making a comeback following several years in the political wilderness, after being jailed for corruption in 1999. "Anyone who suggests that isn't just wrong, he's a fool... 30%-40% (of Shas supporters) will leave us," the rabbi says. "They judged him in court - why take someone who is a thief?" the agitated Rabbi Yosef asks Hakak. "Why would you take someone who accepts bribes?" Addressing Deri's respect for Rabbi Yosef's authority, or lack thereof, the rabbi added: "I know from past experience, Aryeh is too independent. A number of times I have spoken with him - he didn't want to listen." At one point he even refers to Deri as a "rasha," or wicked person, when relating Deri's ouster of a family member from a particular position within Shas. "Your mother cried tears," he related. If he wanted to run a party, suggested Rabbi Yosef, "let them make him his own party... I won't betray Eli Yishai." The recordings come as tensions between Deri and former Shas party head Eli Yishai continue to escalate. Yishai headed Shas following Deri's incarceration, but despite Rabbi Yosef's harsh words for Deri, four years after the recording he backed him to take over from Yishai. The two were at loggerheads ever since then, with Yishai being effectively sidelined by his arch-rival and even prevented from attending a memorial service for Rabbi Yosef. The tensions led Yishai to break away earlier this month and form his own party, Ha'am Itanu. Polls showed that the party would split Shas's electoral strength, and left some Shas officials concerned for the party's very future. But the drama deepened further still after a pact between Shas and Ha'am Itanu not to attack one another was left in tatters when Deri publicly slammed Yishai during a press conference. Deri loyalists have threatened violence against Yishai for breaking away from Shas, and a group of extremists even disrupted a press conference announcing Yishai's new party, which was initially called "Yachad" before being changed to Ha'am Itanu. One Shas supporter was arrested over the incident in Jerusalem's Ramada hotel. In response, Yishai said he possessed recordings of Rabbi Yosef which clearly showed his support for him over Deri, and implied he would be releasing them at some point; the latest recordings are believed to be only the first of several. Intriguingly, Channel Two claims that subsequent recordings will reveal just why, despite his harsh words for Deri, Rabbi Yosef eventually agreed to support him over Yishai four years after the recording.